Decades after his death in 1989, painter Salvador Dalí is continuing to make art, or at the very least, something surreal. Last month, a Spanish judge ordered the artist’s body to be exhumed for a paternity suit filed by a television psychic. The fortune teller, Pilar Abel, claims she is Dalí’s daughter and has been fighting to get the artist’s DNA since at least 2007. 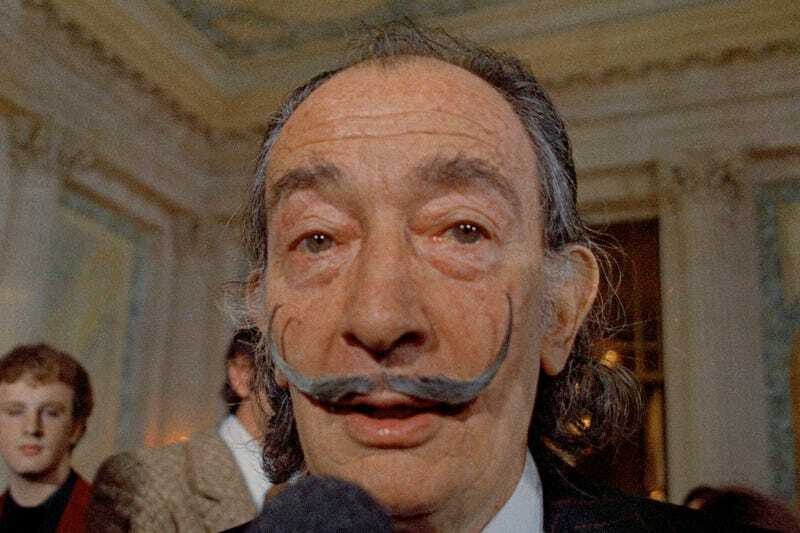 Now that Dalí’s corpse has finally been exhumed, his embalmer is happy to report the artist’s signature mustache has remained perfectly coiffed. Bardalet added that the rest of Dalí’s very dead body resembled “a mummy.” Regardless, the surrealist’s still-styled mustache made the embalmer very emotional. “Before agreeing to such an invasive act as the exhumation of Salvador Dalí in a museum, the claimant Pilar Abel Martínez—as proposed by the Foundation and the Spanish State—should have been required to carry out a DNA test to compare her DNA with that of her legal father (deceased) or her brother, to thereby obtain all available evidence that she is not their daughter or sister,” the foundation said. The results of the DNA test are expected to be shared in the next month or two, according to The Guardian. If the test shows Abel is indeed Dalí’s daughter, she could inherit 25 percent of the artist’s estate, the Telegraph reports. Dalí’s estate says it could take legal action against Abel regardless of the outcome of the test. The whole situation is pretty surreal. We’re confident Dalí wouldn’t have it any other way. More Stuff That's Like "Huh, What?" What Did Five Woody Woodpecker Dolls Do to Upset David Lynch?